Sometimes you seek out special places and sometimes you come across them sort of by accident. As mentioned in my previous post I recently spent some time near Bath/Chippenham to attend a course at Special Plants Nursery. This was a two day course so a B&B was required. After some hunting around the recommended list I was given I chose one called Ridleys Cheer. (Partly I admit because I liked the name!). The website says it has an 'entrancing and secluded garden'. Now visiting a garden in October is on the edge of when most gardens looks good and descriptions like that can hide a multitude of sins, but I thought I would give it a go. To my relief there was indeed much to look at. The garden itself is certainly a labour of love and you quickly realise that whilst there are many roses and some lovely planting, the owners love trees. They bought the house c1968 and have slowly added to the amount of land that they have to create a space that covers several acres. They boast of 125 different rose varieties, but this was not the time of year to appreciate that fully unfortunately. The glory of this garden is the arboretum. Yes they have their own 2 acre arboretum in which they have planted over 4000 trees. It is the most incredible space. I went for wander in the late afternoon and ended up just sitting and listening to the sounds of the trees and the birds. (I didn't know pheasants coughed!). As the light fell it wasn't eery, it was just peaceful and serene. I think the owners started to think I had got lost I was out there so long. They have many magnolias which just makes me want to return in magnolia time to see them in their glory. They also have wildflower meadows complete with rams (I avoided the rams even though I was told they were harmless). I do sometimes wonder if it is obligatory to plant Silver Birches in threes? They do look stunning and I like the effect - but I do get the desire to see four in a group, or maybe six. Maybe even numbers just look a bit too grid like? 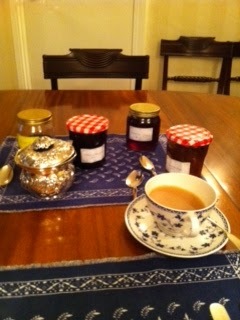 and I am fairly sure that the best breakfasts involve special spoons for the jam. I visited Special Plants as we were passing by but never got to see the gardens. I mean to do one of the courses there next year if I remember. Lovely photos.